Your host for the Nelson PD-PL Math series. Please feel free to contact me directly via the BigMarker Contact button if you have any questions regarding this series. Ruthie Sloan is a teacher (learner) and creative thinker in the Peel District School Board, in Caledon, Ont. As an MA graduate from OISE’s Dr. Eric Jackman Institute of Child Studies, Ruthie has used her research background in child-development to fuel her own curiosities and work with educators across the province. Through various experiences as a Keynoter for ETFO, facilitating workshops for OTF and OAME, writing math content for Knowledgehook and JUMPmath, and articling and reviewing research reviews for OAME Gazette, Ruthie continues to share her love for research and learning with diverse learning communities. In addition to this love, Ruthie and her husband Dave, have 2 boys (Isaiah and Max) who are teaching them how to be epic parents. Ruthie loves running in the winter, reading, tweeting and blogging on topics of vulnerable teaching, math, assessment and creative problem-solving with technology. 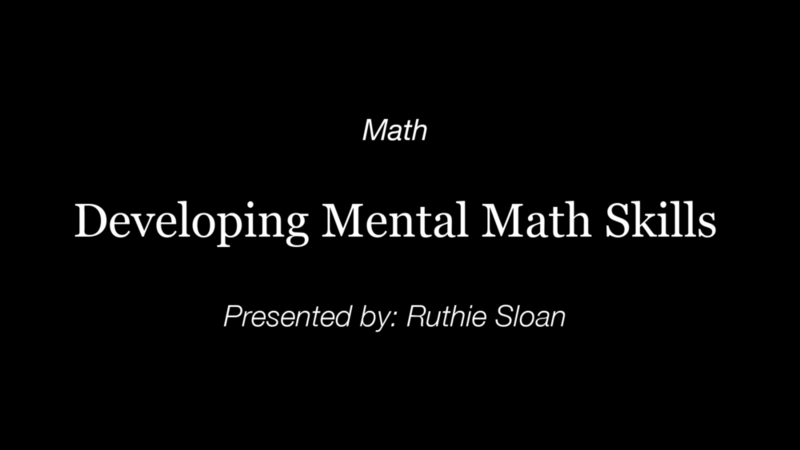 Series Overview How do we set the foundations and conditions for our students to experience mathematical empowerment? How do we translate new shifts in math that are focusing on fluency, mastery and proficiency? What does (or could) it look like in the learning adventures of our students? What questions still linger within our own practise? Given the unique profiles of all of our learners, navigating ‘how’ new shifts in math might look when implemented are BIG questions which we are often left to tackle alone -- but it doesn’t have to be a path we walk alone! This series is intended as a ‘book-club format’ in which the focus is an invitation for groups of teachers, educational support staff and coaches within grade level/districts to meet once a week to co-learning/reflecting (and unpack) some of these new directions in math teaching and learning together. While each session is distinct in content, each webinar builds on the knowledge gained and questions posed by participants in the previous session. Prior to each session, groups will be given reflection questions to unpack together as well as resources (and homework) to share with group. The purpose of this PD is to honour and cultivate powerful teacher reflection and be responsive to unique needs of ‘Teacher learners’ across schools. All shared ready-made and user-friendly curricular materials, lesson plans, videos, resources, and activities will be curated and tailored based on feedback/questions/curiosities from PD groups. Working with Numbers: Unpacking the foundations - Webinar 1 will cover the following: •	Unpacking and defining Number Sense (thinking about what it is and what it is not) •	Looking at big ideas (Whole Numbers, Fractions and Decimals) and how they develop and considering the ‘language of math development’ across grades. Reflecting on: •	Our own identities/experiences (and insecurities) in our developing understanding Number Sense and thinking about connections it has to our practise and student learning •	Ideas and resources to help assess and intentionally plan for developing student thinking on: whole numbers; fractions and decimals. Got some great ideas. Looking forward to the shared resources and trying out the Math Games online! I enjoyed learning about resources that can help students having difficulties, particularly in their comprehension of math skills--number sense. I found that the tech help was very useful. I learned a lot and am looking forward to using knowledge hook with my students. How do we set the foundations and conditions for our students to experience mathematical empowerment? How do we translate new shifts in math that are focusing on fluency, mastery and proficiency? What does (or could) it look like in the learning adventures of our students? What questions still linger within our own practise? Given the unique profiles of all of our learners, navigating ‘how’ new shifts in math might look when implemented are BIG questions which we are often left to tackle alone -- but it doesn’t have to be a path we walk alone! This series is intended as a ‘book-club format’ in which the focus is an invitation for groups of teachers, educational support staff and coaches within grade level/districts to meet once a week to co-learning/reflecting (and unpack) some of these new directions in math teaching and learning together. While each session is distinct in content, each webinar builds on the knowledge gained and questions posed by participants in the previous session. Prior to each session, groups will be given reflection questions to unpack together as well as resources (and homework) to share with group. The purpose of this PD is to honour and cultivate powerful teacher reflection and be responsive to unique needs of ‘Teacher learners’ across schools. All shared ready-made and user-friendly curricular materials, lesson plans, videos, resources, and activities will be curated and tailored based on feedback/questions/curiosities from PD groups. * Use of games in math instruction: Thinking about how much guidance we give and when to deepen students thinking.